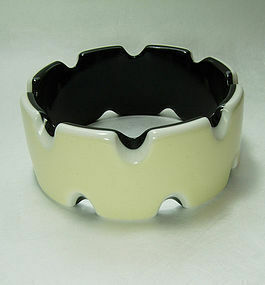 Chic modernist 1970s French laminated Lucite bangle bracelet with a layer of black on the inside and a layer of cream or ivory on the outside, with geometric cutouts. The cut edges and the outer edges of the cream layer are a lighter cooler white, intentional and part of the design, as the edges are very uniform. In the style of Lea Stein jewelry. 1 1/4 inches wide and 2 9/16 inches inside diameter. Excellent condition with one small manufacturing flaw at on edge, pictured but not noticeable at a short distance. Display form is life size. Photos enlarged to show detail.